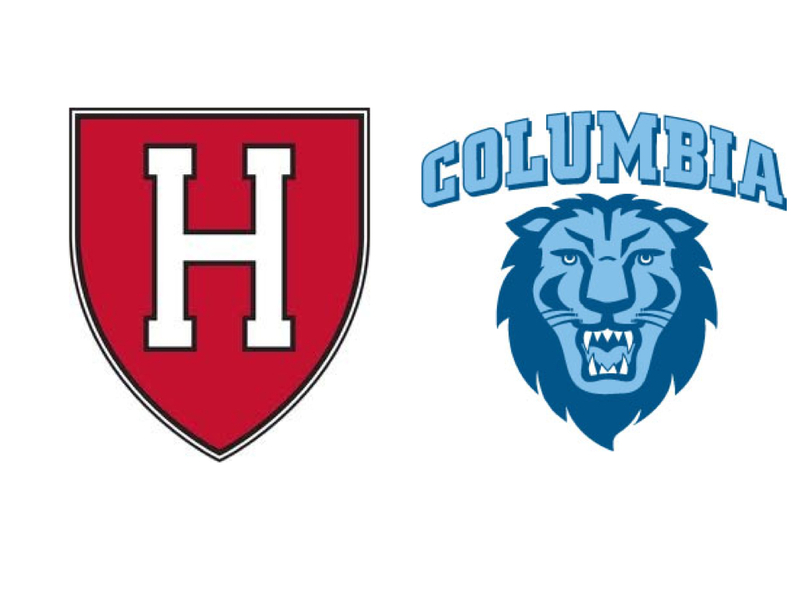 Harvard and Columbia both swept their weekends and did some rewriting of the history books. Two teams gained ground in the standings this weekend with historic sweeps. Harvard opened up a one game lead on second-place Yale after bulldozing Penn at the Palestra and earning its first victory since 1989 at Jadwin. Meanwhile, Columbia swept an Ivy weekend for the first time in five years and moved into a tie for third, edging Brown on Friday and stopping Yale on national TV on Sunday. Let”s take a look at the weekend”s big winners. Harvard has made a habit of rewriting the record books recently. Given all that the Crimson have accomplished in the past three seasons, one record of futility that has withstood the test of time has been Harvard”s losing streak at Jadwin Gymnasium. Twenty four consecutive visits to Central Jersey had produced twenty four straight losses dating back to the existence of the Soviet Union. On Saturday night, that finally changed. One night after dominating Penn behind a balanced attack that featured four scorers in double figures, Harvard buckled down on the defensive end and held Princeton to just 0.75 points per possession, clamping down especially tightly in the second half and allowing just 18 points in a 59-47 win at Jadwin. The Crimson held Will Barrett scoreless and limited Hans Brase to just three points, adjusting to the Tigers” first half backdoor success by clogging the paint, while still managing to successfully contest Princeton”s perimeter shooters. Despite a tough night for Wesley Saunders, Harvard mustered up enough offense to put away Princeton early in the second half. Brandyn Curry scored 17 points off the bench, while Steve Moundou-Missi managed a double-double (11 pts, 10 rbs). The road sweep completed a 4-0 season against the traditional powerhouse Ps, the first 4-0 season sweep in Harvard”s 103-year program history against the schools. With Yale”s loss on Sunday afternoon to Columbia, Harvard is now in the driver”s seat for another Ivy title and NCAA berth. The Crimson host Cornell and Columbia next weekend. If Yale is swept on its southern road trip and Harvard takes care of Cornell, Harvard can clinch a solo title at Lavietes on Saturday night with a win. If Yale manages one or two wins and Harvard sweeps at home, the Crimson can clinch a solo title in New Haven on March 7th. We”ve known that the Lions were capable of a weekend like this, but it was nice to see Kyle Smith”s squad finally execute in two consecutive games against two top half teams. On Friday, a huge night from the Rosenberg-Lyles-Lo trio– they accounted for 59 of Columbia”s 70 points– led the Lions past a shorthanded Brown squad that was missing big man Rafael Maia. It took a staunch defensive effort down the stretch to secure the win as Columbia held the Bears scoreless in the game”s final two minutes. Maodo Lo”s two free throws with 14 seconds remaining provided the final 70-68 margin when Sean McGonagill”s contested three at the buzzer was off target. On Sunday afternoon, a full house at Levien provided the backdrop for a physical contest between two of the Ivy”s best. The growing feeling around the Columbia program for the past few seasons has been a rising hopefulness tempered by the pain of countless close losses and an inability to get over the hump. This nationally televised game against surging Yale, without starting guard Grant Mullins, was a game that old Columbia would lose, probably in the final minutes for good measure. But this year”s Columbia team has too much talent and is too well-coached to roll over like the Lions of old. Smith”s game plan to clog the paint and make life difficult for Justin Sears was executed effectively. The Lions challenged other Bulldogs to beat them, but no one was up to the challenge. Behind Steve Frankoski”s shooting and Lo and Rosenberg”s tireless slashing to the hole, Columbia opened up a double-digit second half lead and quickly rebuffed Yale”s only run, sprinting away with a comfortable victory. Columbia”s depth was on full display as Frankoski, Jeff Coby, and even Conor Voss all contributed valuable minutes for the high-energy Lions. The weekend sweep was Columbia”s first since February 13-14, 2009. At 6-4, the Lions have a great shot to finish over .500 in league play for the first time since 1993. With an overall record of 17-10, Columbia now has its most wins in a season in 35 years. The Lions will be postseason-eligible regardless of how they finish, but two wins in their final four games would make them an attractive postseason candidate for the CBI and CIT tournaments. A postseason berth would be Columbia”s first in the modern era. Many casual basketball fans were probably surprised to see Brown and Cornell on national television on Saturday night, but those who decided to stick around and watch were treated to a few unbelievable individual performances and some exciting end-game drama. Cedric Kuakumensah– the same player who had struggled all season to get his offensive game on track– managed to record a double-double before halftime. By the time the night was over, Kuakumensah had tallied the Ivy League”s most impressive stat line of the year: 30 points, 14 rebounds, and 7 blocks. Leland King, filling in for the injured Rafael Maia, took advantage of his opportunity against the weak Big Red frontcourt, going for 23 points, 12 rebounds, and 4 assists. The Bears managed to prevail in overtime, thanks in large part to a timely Sean McGonagill three pointer. In the losing effort, the Cornell backcourt managed to record two wild stat lines of its own. Star scorer Nolan Cressler poured in a career high 34 points on 9-19 FG, and fellow guard Devin Cherry got within striking distance of a triple-double as he continued his impressive season, tallying 17 points, 10 assists, and 7 rebounds. The Big Red guards also deserve recognition for the defensive job they did on McGonagill, who had one of the roughest shooting performances of his career (2-12 FG). You forgot to list one other set of winners and losers this weekend, Ivy basketball itself, which was both a big winner and a big loser. The product on the floor, up and down the standings with the exception of Penn and Cornell, has never been better. Winner, big winner. But the competition for the Ivy championship and the NCAA bid have never been weaker. Loser, big loser. We had more competition when it was Penn and Princeton every year. At least two teams had a shot. Despite greater coaching and player talent at Brown, Columbia and Yale — a huge step forward — Harvard and its loose admissions standards will destroy this conference, either by eliminating any semblance of competition for the championship *OR* by forcing the other Ivies to lower their own academic standards. I’m not sure which is worse. What is worse is the latter proposition: a general lowering of academic standards. But if anyone thinks that the sport of basketball will ever drive the Ivy League bus let me assure you it will never happen. One rogue program ought not be allowed to undermine what has been a very successful association of heretofore like-minded institutions.